I received your nice letter today and I am writing to you right away. We are all in good health, thank God. My family is small now; I only have a girl of 14 years at home, Florenze. The others are all married. One [daughter] died, Josephine, 23 years old. Business is not going well; millions are out of work and everything is very expensive. We, too, have to be frugal; I am the sole breadwinner now. I was making 35 dollars per week before, as of now only 25 dollars. to your address, you will see what is in there, it is paid for until your house, in case you have to pay anything it is not my fault. It should not happen, though. I do have a favor to ask you, my niece Mary Höhl, your stepdaughter, shall receive one third of the items since she is related to us. Dear sister-in-law, sometime later there will be another box arriving with shoes and miscellaneous stuff, you will put it to good use, I suppose. Please do not forget what I wrote you here, be nice and immediately write as soon as you receive this letter. This letter will arrive before the box in any case, because the cargo takes a long time. Last year I sent something to my wife’s relatives; it took 3 months until they got it. Hopefully you will receive everything and nothing will be stolen like it has happened often. I do not want to send anything for those blackguards. 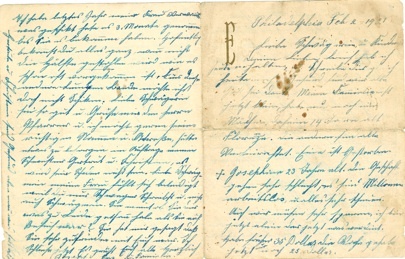 Dear sister-in-law, please say hello the minister and I would like to [greet] his nuns and [illegible]. I have something to finish for him. It should not be to his detriment. Dear sister-in-law, my wife is offended by the fact that you are writing only Brother-in-law and not Sister-in-law, too. She was wondering whether she upset you when she was visiting. She told me she was very content with you. I will finish now, greetings to all, cordially Joseph Enz and family. 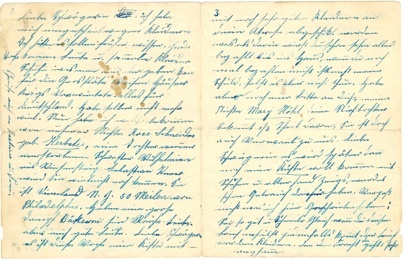 Sentence from page 2: Greetings to Bastian and wife. Sentence from page 4: Gertrud and Christine are in good health, but you never know.